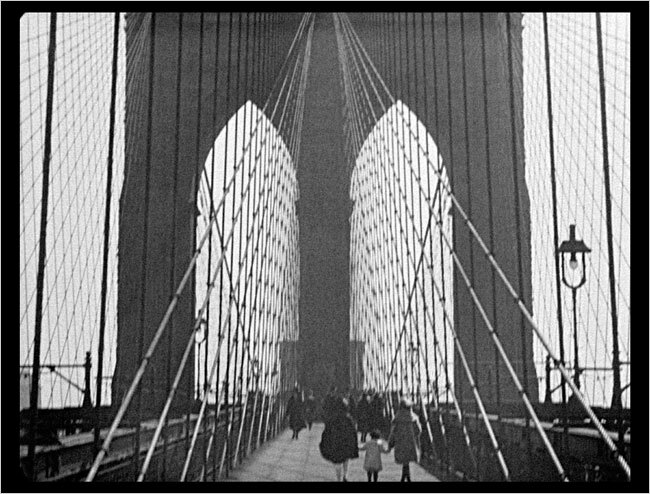 In the early 1920s, a new genre of creative documentary emerged: the city symphony. Seeking to capture the essence of a given city, the films were often made by people with a background in the avant garde or the fine arts. Manhatta (1921), generally considered to be the first city symphony, was directed by the Modernist photographers Charles Sheeler and Paul Strand – Sheeler was also a pioneering Precisionist painter, while Strand's photography helped establish the mechanical medium as an art form. This, along with the use of Walt Whitman's poetry in Manhatta's intertitles, helped to link the fledgling genre inexorably with the fine arts, and with poetry in particular. However, as the 1920s wore on, city symphonists began to eschew written intertitles in favour of creating poetry directly through film form. This style reached its apotheosis in the two best, and best remembered, examples: Walter Ruttmann's Berlin: Symphony of a Great City (1927) and Dziga Vertov's Man with a Movie Camera (1929). Ruttmann had studied architecture, painting and the violin before beginning his filmmaking career with a series of abstract animations, and these influences can be detected in Berlin's preoccupation with rhythm, movement and the physical shape of the city – all of which were common themes in the city symphonies of the 1920s. In mid-2013, I decided that the time was right to create a new city symphony. There was a rise of divisive politics surging through the UK, and my collaborators and I wanted to respond by creating a positive portrait of London, a diverse city which has benefitted hugely from its cosmopolitan nature. Beyond this, austerity politics was widening the economic divide within London, while rampant building work continued unabated, changing the shape of the city beyond recognition. It felt like a crucial time in the city's history, and something worth capturing before it was too late. Since the 1920s, the city symphony genre has evolved: first, into the travelogue, and then into essay films like Terence Davies' Of Time and the City (2008). For London Symphony, however, my collaborators and I decided to return to the poetic form used by the filmmakers of the 1920s. To us, this style was not only a valid form of expression, but a powerful way to express ideas in a subtle and non-didactic way. As I've said elsewhere, my feeling is that just because you can shoot in widescreen colour with synchronised sound, it doesn't necessary mean that you should – for me, sound cinema should be seen as a distinct medium from silent cinema, and not as its evolution. With this in mind, the validity of silent film grammar as a mode of expression remains undiminished. I also believe that films which foreground the primacy of the cinematic experience and place image and montage above narrative reach the purest level of the medium – taking it closer, as an aesthetic experience, to music. Examples of this purity can be found not only in the work of symphonists like Vertov and Ruttmann, but also in experimental filmmakers like Peter Kubelka, arthouse filmmakers like Béla Tarr, and even, to an extent, in mainstream films like Mad Max: Fury Road (2015). Of course, to create such a work requires realistic expectations about the commercial appeal of the end product. With this in mind, we decided to finance the film through crowdfunding, hoping that we would appeal to members of the ever-expanding silent film community: although we were aware that our film would have niche appeal, we were also conscious that it was a clearly defined niche which contained potential for strong support. Thankfully, we found this support, ultimately tapping into people's love of London as much as their love of silent film, and made our target with relative ease. Prior to the crowdfunding campaign, I had developed a script for the project alongside writer Rahim Moledina. As we entered the shooting phase of the production, however, I wanted to move away from preconceived ideas and images in favour of taking a more organic approach to the film. With this in mind, I broke the script down into a list of locations, which then formed the basis of the shoot itself. One of the challenges we faced was the fact that London means so many different things to so many different people. During our crowdfunding campaign we began talking to people and gathering ideas to incorporate into the script, but another way we tried to broaden the film's scope was to use a team of cinematographers. Each of these people had a different perspective on the city – some, like myself, were native Londoners, while others had been here for many years. Some, meanwhile, were relative newcomers. To make sure that we were all on the same page, I drafted up a style guide and put together a document of reference images and films. But beyond this, I tried to give my cinematographers freedom to capture the city as they saw it. Indeed, sometimes they would go off to pre-agreed locations and shoot without me even being present. 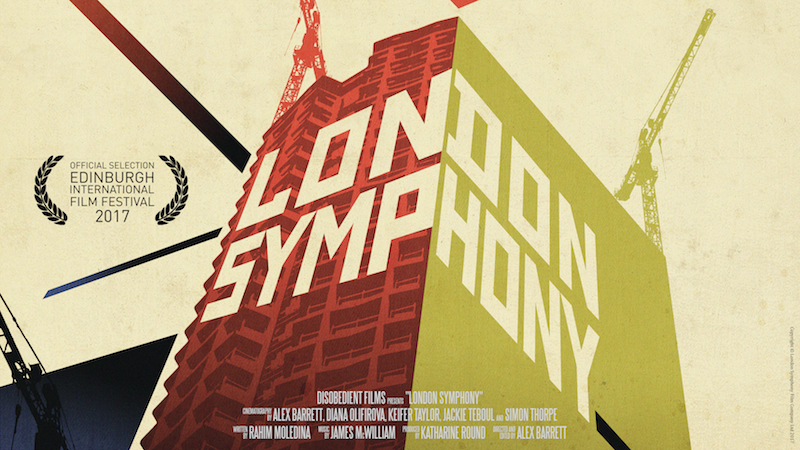 London Symphony Trailer from Flicker Alley on Vimeo. My approach to the soundtrack was similarly collaborative, and the film's composer, James McWilliam, was my key creative partner. James and I always saw London Symphony as an interdisciplinary project, and we knew that the music was of equal importance to the visuals. With this in mind, we began discussing the music right at the start of the entire process, when Rahim and I were still developing the film's themes. At this time, James wrote a structure for the music, which broke the 'symphony' down into four movements, and each of those movements into many different sub-sections. It also told us, to the second, how long each part would be, along with its tone and tempo. This structure was used to give shape to the script and, more importantly, to the edit. The original plan had been for me to cut to the music but, during postproduction, the edit moved quicker than the composing, and I ended up editing silent, with much of the score written later – but everything I did was based on the structure, therefore giving the music and image a unity, even in their separateness (James' music is not a conventional film score, and does not follow the picture exactly, but instead coalesces with the image at several key moments). With the film complete, we premiered in competition for the Michael Powell Award at the Edinburgh International Film Festival 2017, prior to launching our theatrical tour in September. We organised the tour ourselves, working directly with the venues to arrange the bookings. Our original aim had been to screen at 5-10 venues inside London, and 5-10 venues outside London. In the end we had over 70 screenings across 55 venues throughout the UK, from Falmouth to Inverness, many of which were presented with Q&As. Thanks to a grant from the Arts Council England, we were also able to present four screenings with live orchestral accompaniment from the Covent Garden Sinfonia, which had always been our aim. These live screenings included our sold-out launch event at the Barbican Centre, another at London's iconic Alexandra and Ainsworth estate, and one at the Shree Ganapathy Temple in Wimbledon. The use of alternative spaces extended beyond the live events, with screenings in museums, churches and even a Buddhist Meditation Centre. In addition, we teamed up with a number of film clubs and community cinemas, which were perfect partners for a film like ours, which was always intended as a kind of community project. Indeed, all of the screenings were marketed individually, with small (mostly social media) campaigns targeted at the relevant local communities. Luckily, our efforts were bolstered by a strong reception from the UK press. The theatrical release was followed by a worldwide VOD and Blu-ray release through silent film specialist Flicker Alley, and a UK DVD release courtesy of New Wave Films. It was also released on the BFI Player in the UK, where it was picked by Mark Kermode as his Choice of the Week. In addition to the public screenings, I've also presented the film during a number of guest lectures at universities and academic institutions around the country, and it's been extremely rewarding to talk to students about my process and, even more so, to help them learn about the wonders of the city symphony and its small but significant place in film history.